OK so yes, I am a bad blogger, the type of blogger I personally hate. I hate it when I love to read a blog and it is not updated in a timely manner. So I am sorry about that. I think the problem is that while I find everything Zach does highly fascinating and wonderful, I doubt that others really do as well. 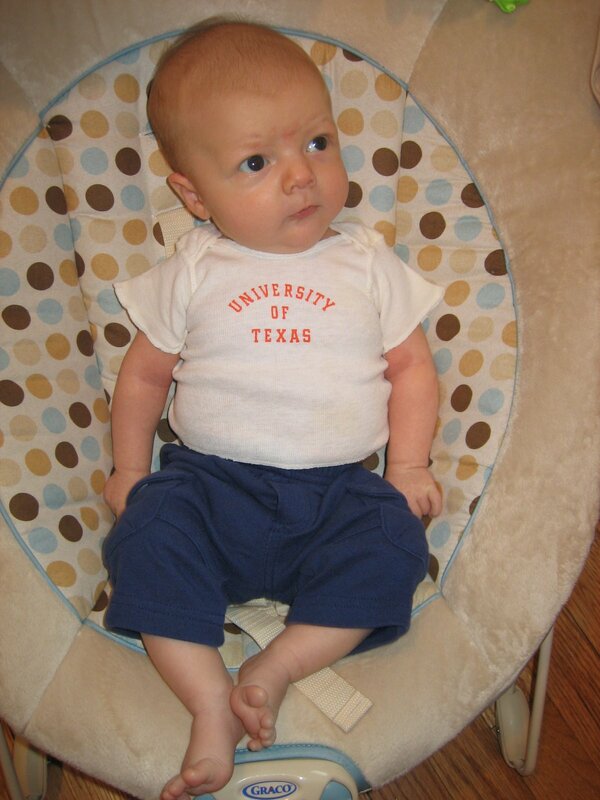 Apparently I am highly mistaken – per his Auntie, Grandparents and Great-Grandparents. So I will try to be better and now that I have a video camera will be posting videos of my precious pumpkin. Zach has really started moving a lot more each day. He kicks his feet and waves his arms. He tries to reach for things above him and to his sides. His eyes still cross every once in a while when he tries to focus – a totally normal thing that I find totally adorable. I know next weekend his Grandaddy will take some good video of all his movements. 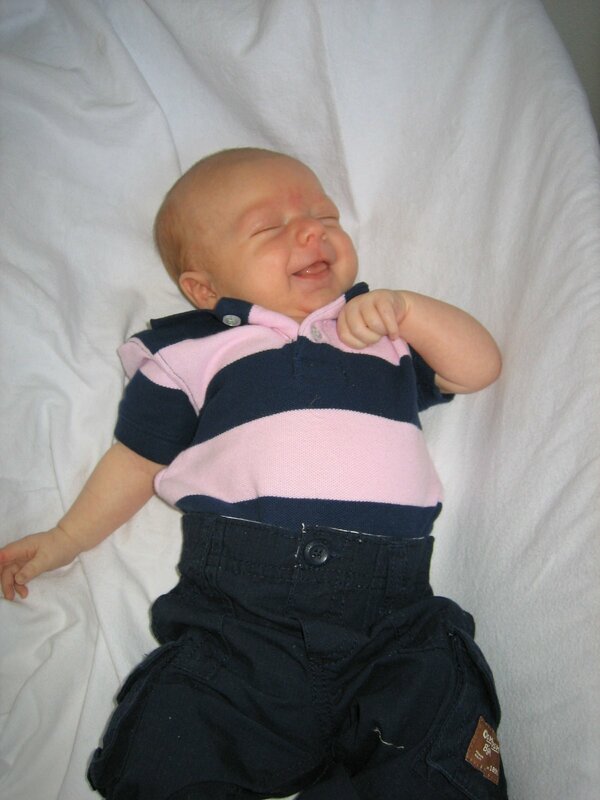 Zach celebrated his first Valentine’s Day in his snazzy pink and blue outfit. Alex tried to claim it was for girls but I bought it in the boys section. In the pants he does look a bit like he should be checking into a retirement center in Florida…but I love the look anyway. I tried to make him hold a red heart ring (don’t tell Alex) but while he can grasp things, he does not like to hold on for very long. The shirt in the below pic and the intro one was mine when I was a baby. Technically it is for a 3 month old, but I am about 6 weeks in my photos wearing it, and I think Zach – or his belly at least – has outgrown it at 8. 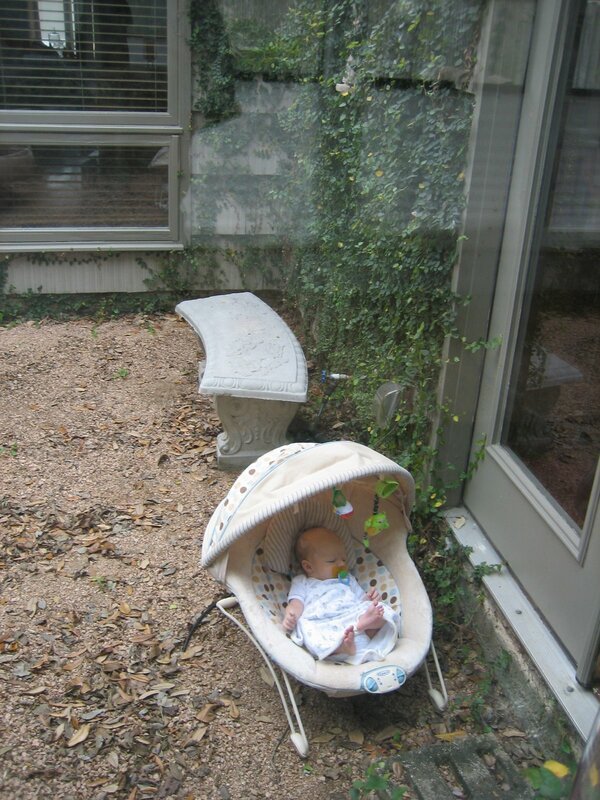 I discovered that Zach (like most babies apparently) loves to be outside. So the other day I put him in the atrium at our house. I thought it was the perfect place for him! No dogs, no birds and no direct sunlight. It only lasted a few minutes, but he really was loving it for a little while. And finally, Alex’s friend Scott brought over his son, Tyler to visit this weekend. 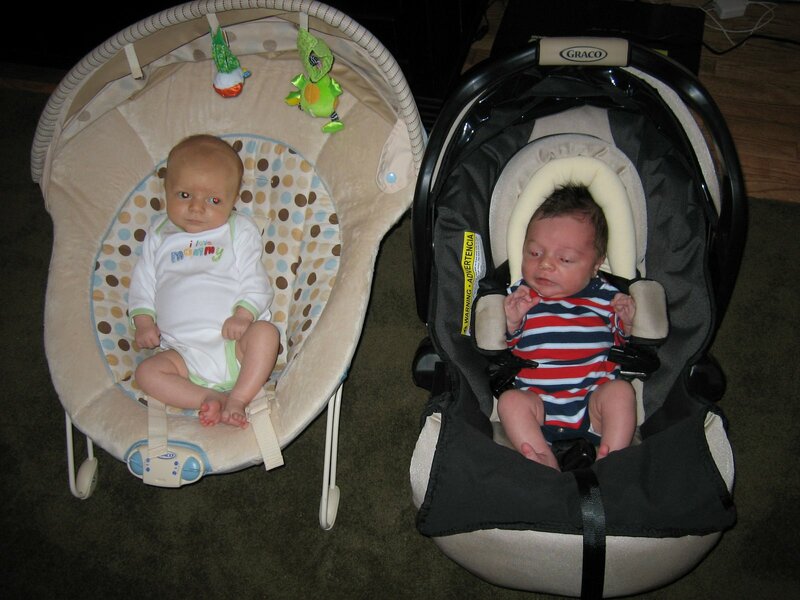 Tyler is just a month younger than Zach. Alex and Scott grew up together and it is fun to see their sons together too. 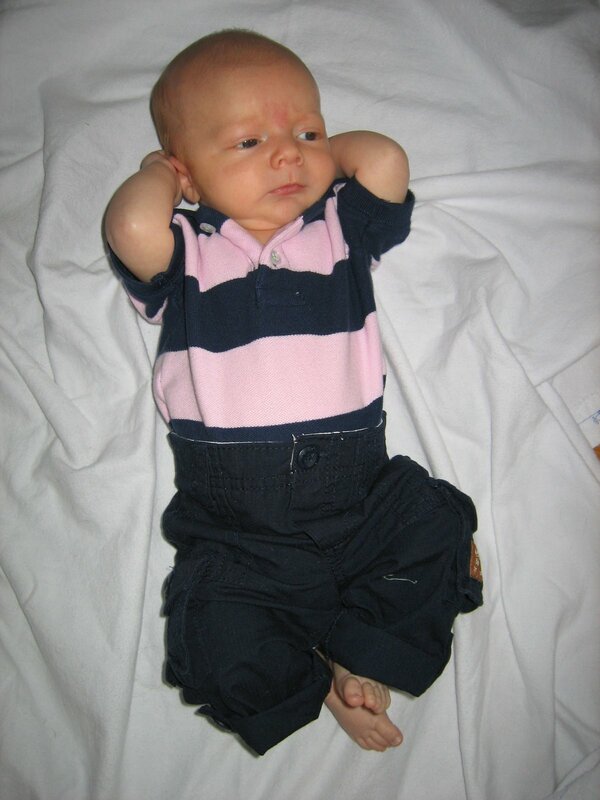 Tyler is still a “real” newborn, with a tiny baby cry and not moving too much. Zach seems so big and so active next to him. I love the updates. I really like the Valentine’s pic of him where he looks like he is cracking up!